Dental implants are considered the gold standard of tooth replacement. They are known for their unsurpassed ability to mimic your natural teeth in appearance, function and comfort. Dental implants are a permanent tooth replacement solution that can be used to replace one missing tooth or multiple missing teeth. Each dental implant is secured into your jawbone with a titanium surgical post, which acts as an artificial tooth root. The completion of a dental implant involves the placement of a dental restoration on top. Depending on your personal smile needs, your restoration may include a crown, bridge or denture. Patients in O'Fallon and the surrounding area can trust Dr. Schwarz for excellence in dental implant restorations and other restorative dental treatments. He carries the experience, skill and artistry it takes to custom craft your dental restoration and finalize a natural and durable dental implant. Although dental implants have a very high success rate, there are times when they need adjustment or repair. Riverheart Family Dentistry proudly offers implant repairs to ensure you retain the comfortable and healthy smile you deserve. Dr. Schwarz has a clear understanding of implants dentistry and the latest techniques involved. He combines his knowledge with a patient-centered approach so that your dental implants are as successful as they were designed to be. 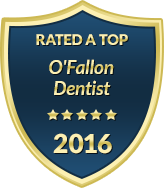 Our office is committed to meeting your dental care needs in the most convenient ways possible. If you need implant repairs, we can likely see you in the same day you call. We also offer early morning and evening appointments during the week to accommodate your busy schedule. To learn more about our top quality dental implant restorations or to schedule an implant repair, please contact Riverheart Family Dentistry today.